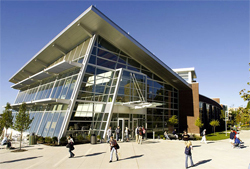 The Student Union building, part of the New Landscape for Learning project, includes The University of Akron Bookstore. In recent years, colleges and universities across the nation have come to realize that academic prominence alone is not enough to attract top students and athletes. 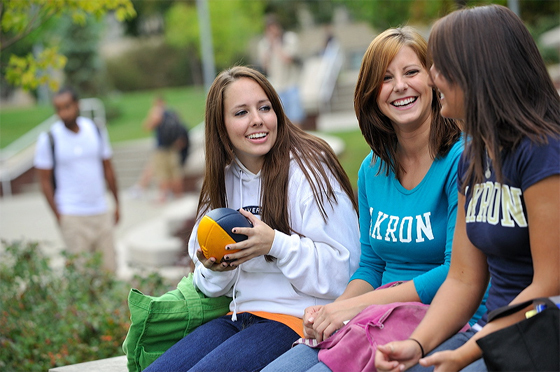 As part of an overall blueprint for learning, The University of Akron has reinvented its campus through the creation of park-like open spaces, improved campus access and new buildings. Led by University President, Dr. Luis M. Proenza, the institution recently completed the first phase of its $300 million New Landscape for Learning campus enhancement program. The five-year project included nine new buildings, 14 major renovations and the addition of 30 acres of green space to the 218-acre campus. The new facilities include two classroom buildings, an Honors Complex, Student Union, Athletic Field House, and the Student Recreation and Wellness Center – recently named one of the top 25 student recreation centers in the nation by Best College Review. 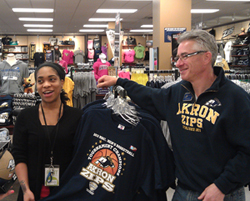 The University of Akron Bookstore Manager Patrick Duff shows his school pride. Changes are apparent not only in the new buildings cropping up across campus, but also in students’ involvement in athletics, student government, and a top-rated student residence hall program.